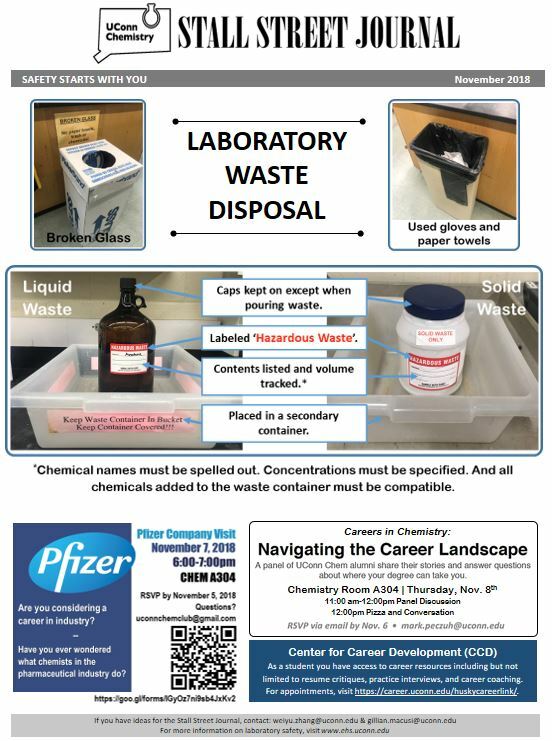 The Joint Safety Team (JST) in the Department of Chemistry at the University of Connecticut is a student-led initiative to build laboratory safety culture within academic labs, expand graduate student understanding of industry laboratory safety culture, and for students to build professional capacity through building and leading projects. If you are a current graduate student bursting with ideas and looking to make an impact on this department while building your professional network and those all-important “soft” skills, contact Jessica A. Martin at jessica.a.martin@uconn.edu. 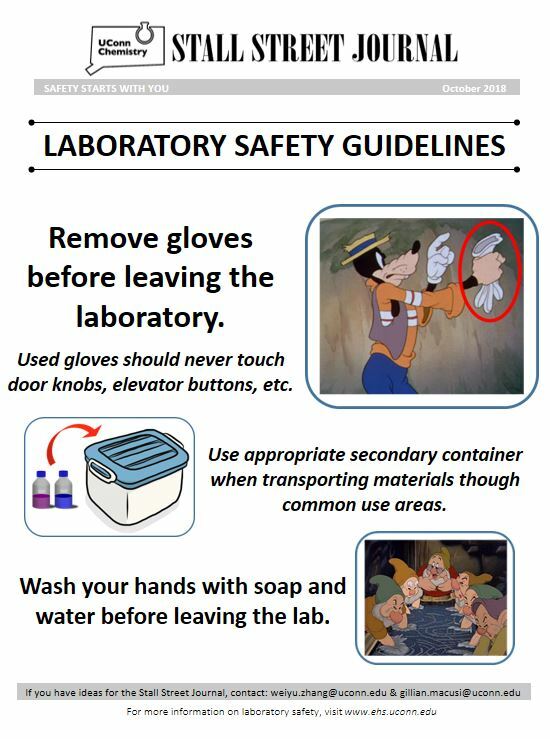 The Joint Safety Team is the creator of the "Stall Street Journal," an effort to bring laboratory safety information (and other fun updates!) to the public. We would like to thank Dr. Christian Bruckner for his active role in this project. 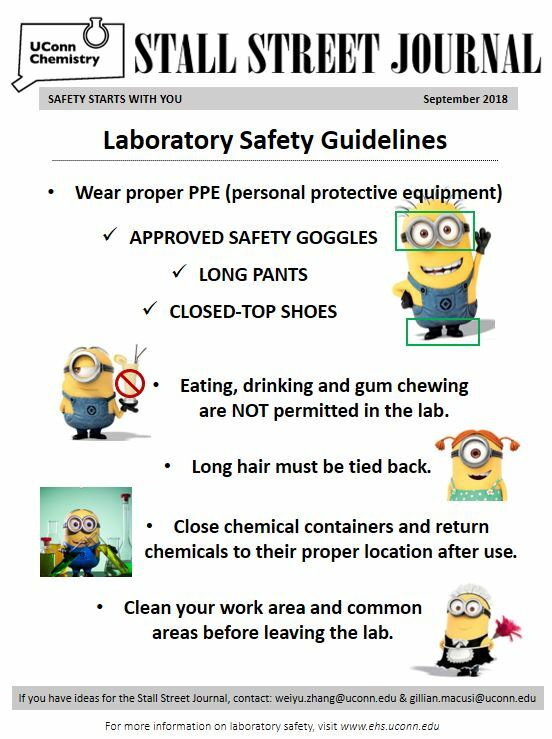 Starting in Spring 2019, Jasmin Portelinha and Cristin Bosko have been working with the staff in Teaching Laboratory Services (TLS) in the Department of Chemistry to create updated, eye-catching signs to promote safety culture and awareness amongst undergraduate students in the teaching labs. We would like to thank Eric Krantz for his active role in this project. Below are posters that have been designed by our team. The Industry Laboratory Tour series was designed to expose graduate students to safety cultue in industrial labs, as well as provide information and networking opportunities for those whose goal is to go into an industry career upon graduation. We would like to thank Drs. Christian Bruckner, Jing Zhao, Mark Peczuh, and Amy Howell, for supporting these tours. 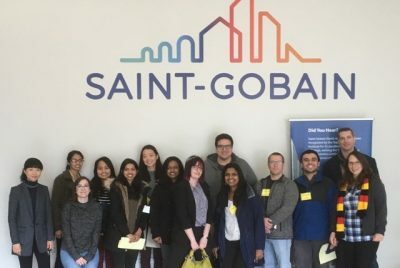 On Friday, April 5th 2019, 12 students from the Department of Chemistry, the Institute of Materials Science (IMS), and the Department of Physics attended a tour of the Saint-Gobain Research facility in Northborough, MA coordinated by Jessica A. Martin. A volunteer carpool was provided by members of the JST: Gillian Macusi, Cristian Aviles-Martin, and Jasmin Portelinha. 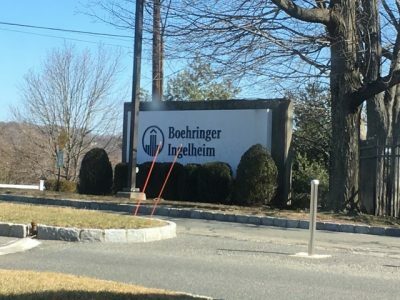 On Tuesday, March 19,2019, 18 students from the Department of Chemistry and the Institute of Materials Science (IMS) attended a day-long tour of the BI facility in Ridgefield, CT coordinated by Jessica A. Martin. A volunteer carpool was provided by members of the JST: Gillian Macusi, Weiyu Zhang, Cristian Aviles-Martin, and Jasmin Portelinha. We would like to thank Diana Arciniegas and Dr. Ling Wu for organizing and hosting our tour, as well as the following scientists who shared their science with us: Sarah Low, Jim King, BC Naranyana, Chen-ming Lee, Emmanuelle Balme, Alex Villalobos, and Khoa Nguyen.